Jack Grow, president of LawToolBox, told me last week that Teams is becoming a popular collaboration tool at larger law firms. 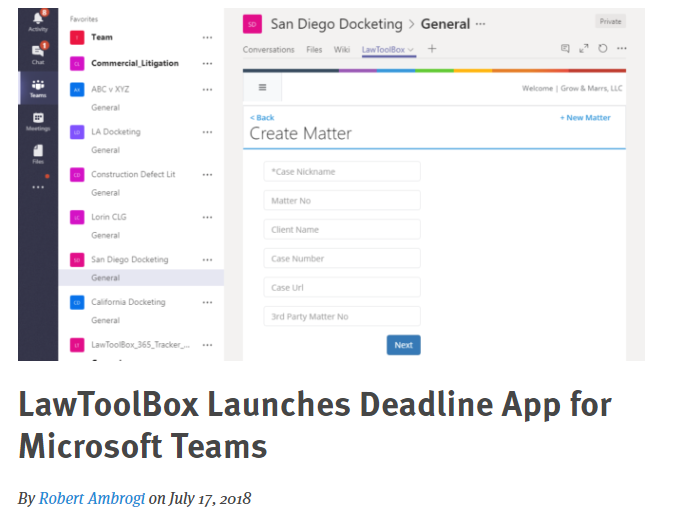 Adoption is likely to increase even more following Microsoft’s announcement last week that it now offers a free version of Teams for organizations of up to 300 people. Calculate litigation and administrative deadlines based on applicable rules. Add, update and remove case-specific deadlines. Update team member Outlook calendars as deadlines and users change. View, email and share deadlines for a matter, user, team or firm-wide. Filter by recent matters, user matters, firm matters, or matter name. View analytics showing average length of matters and motions. Use Microsoft Power BI to analyze relationships with co-workers. Search files in Microsoft SharePoint using key words and phrases.